Kingston Kaiser Chrome Widespread Single Lever Handle Kitchen Faucet GS8011DKLLS: This Widespread Single Lever Handle Kitchen Faucet is built to last. The highest quality standards are used to precision manufacturer a top of the line product. Important features of this BRAND NEW Fixture: Complete Item! Everything necessary for installation is included. 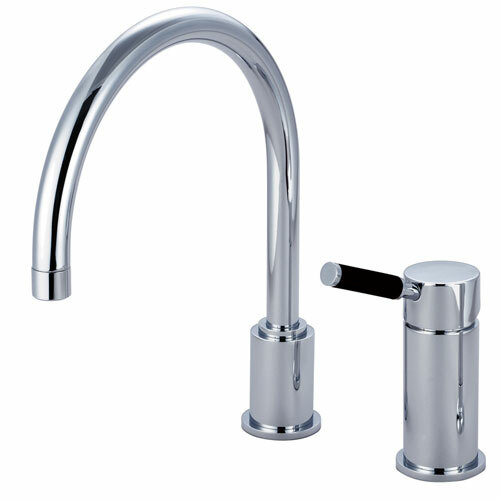 - Solid Metal Lever Handle - Matching Accessories Available - Easy to Install - Installation instructions included - Widespread Single Lever Handle Kitchen Faucet - The widespread single-lever faucet is sleek and easy-to-manage with its solid construction and lucid features. With a variety of finishes provided, the faucet's cutting edge design and functionality serves its purpose as an ideal tool for your kitchen setting. - High Quality Brass Construction - 2.2 GPM / 8.3 LPM at 60 PSI - 1/4 Turn Ceramic Cartridge - Black silicone handle for a great grip and easy clean-up - Chrome premier finish designed to resist fading and tarnishing. This fixture is manufactured by Kingston Brass and is part of their Kaiser collection. The widespread single-lever faucet is sleek and easy-to-manage with its solid construction and lucid features. With a variety of finishes provided, the faucet's cutting edge design and functionality serves its purpose as an ideal tool for your kitchen setting.